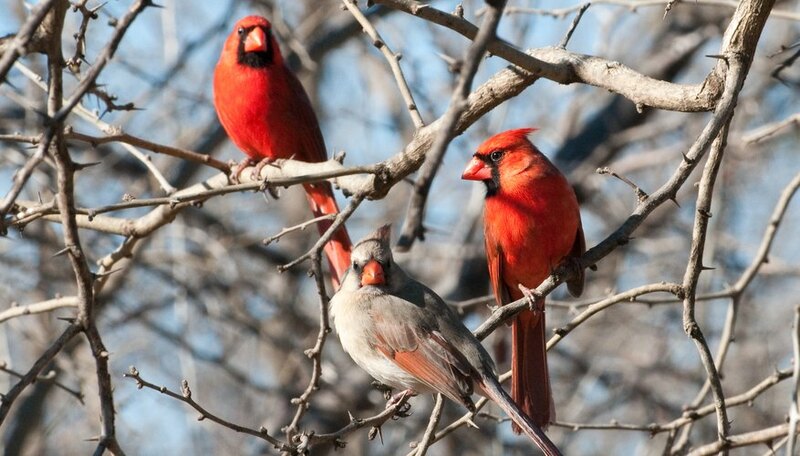 Cardinals, or red birds, may be the most easily-identifiable bird in the world. Their bright red feathers give them away and make them favorites among young and old alike. These songbirds enjoy warmer climates and, unlike other birds, they do not migrate. Over the years, their population has grown partly because of their amazing ability to adapt in parks and suburban areas. The average lifespan of cardinals in the wild is 15 years. Popular sub-species of the cardinal include the Northern Cardinal, popular in the Americas, Desert Cardinals and Vermilion Cardinal. Male cardinals have brilliant red plumage, black faces and reddish beaks. Female cardinals are not nearly as colorful; they have grayish-brown feathers with slightly red tints on in their wings and tails. Female cardinals are smaller than males. Their legs and feet are usually dark red. 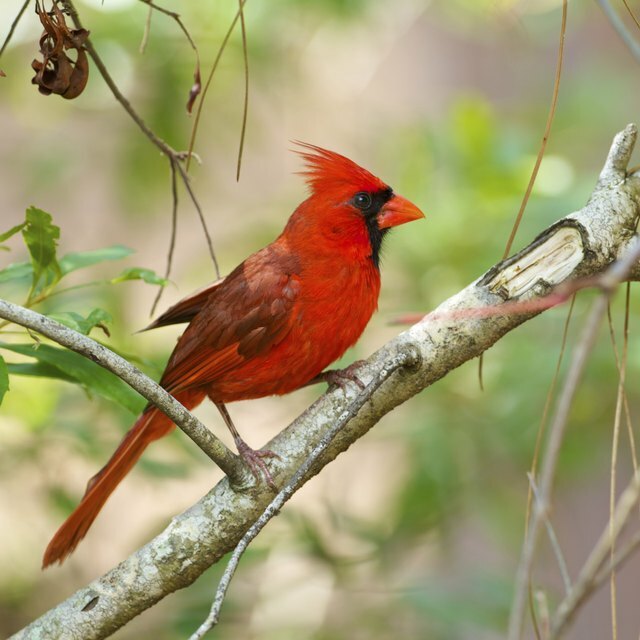 The popular Northern Cardinal is a fairly large songbird, according to the Web site All About Birds, with an average measurement from beak to tail between eight and nine inches long. They have long tails, which look like they are pointing down when the birds are perched. Cardinals prefer being close to the ground, so they nest in low-lying branches of bushes and trees. 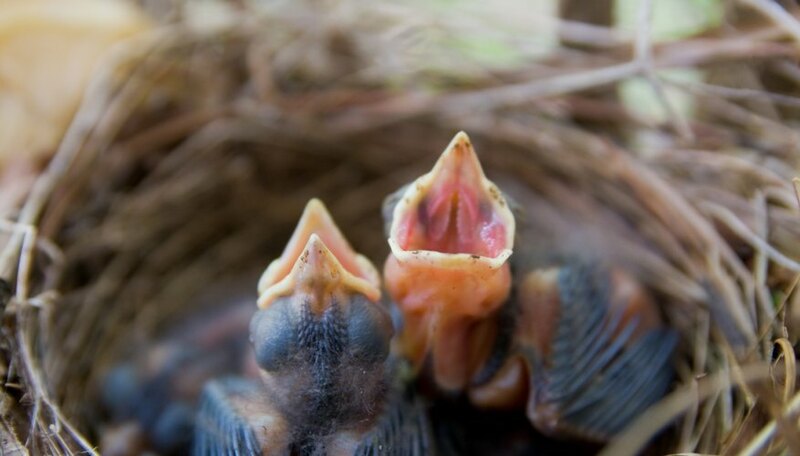 Male and female cardinals sing but females sing more complex melodies. The winter months are for pairing up and preparing for mating season. 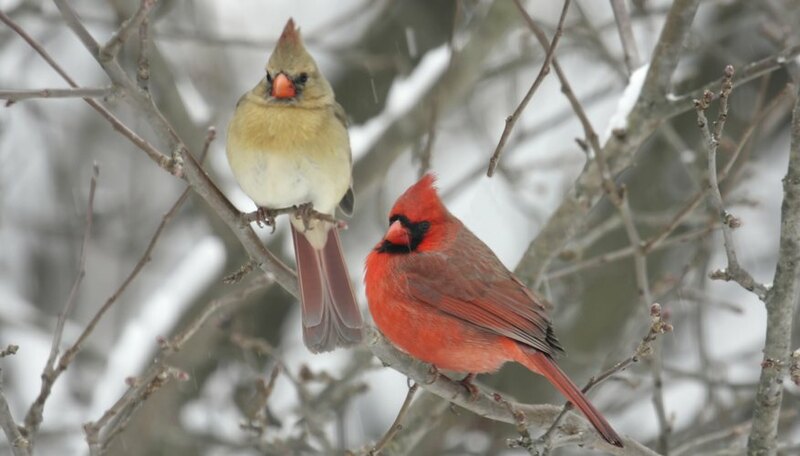 Cardinals impress everyone with their courtship displays and feeding when the male will take bits of food and place it on top of the female’s beak. 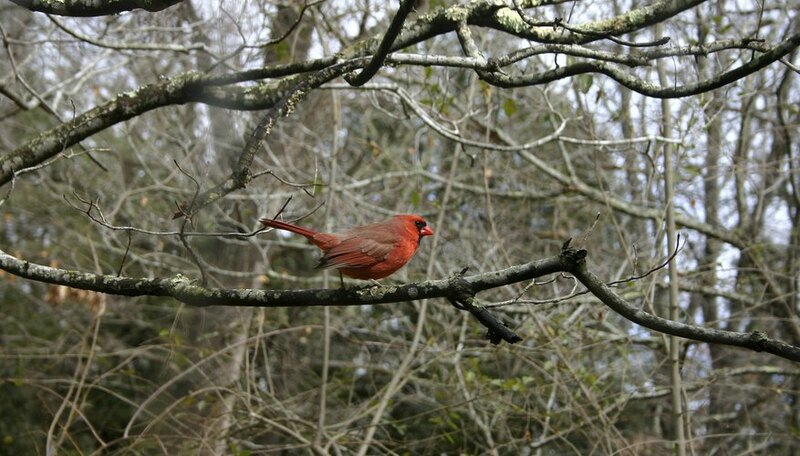 Cardinals live primarily in the southeast portion of North America. Years ago, they were primarily birds of the Southeast but over the years, they have expanded westward along the Mississippi and as far north as Ohio and even Ontario. 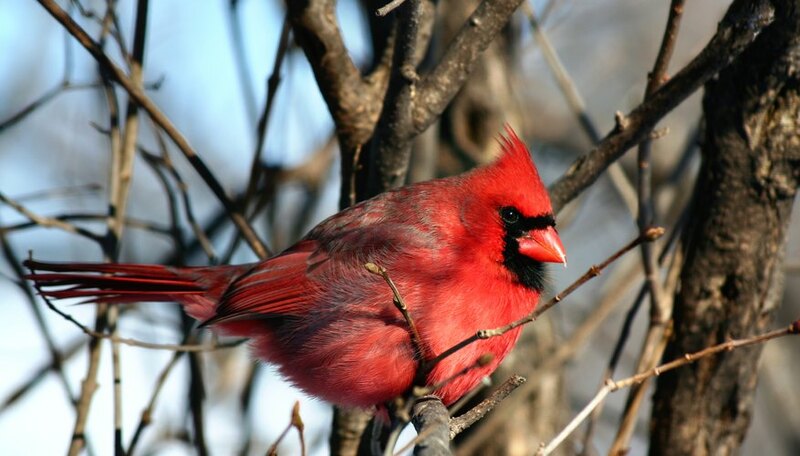 Cardinals adapt to living anywhere and can live in parks and backyards. They enjoy living in shrubs and vines that line the edges of forests. Cardinals generally eat from the ground but are known to eat from feeders as well. Their favorite things to eat are sunflower and safflower seeds. They will also eat other wild bird food. You can entice them by placing food on a tray and if the tray is near a feeder, they may use the feeder. 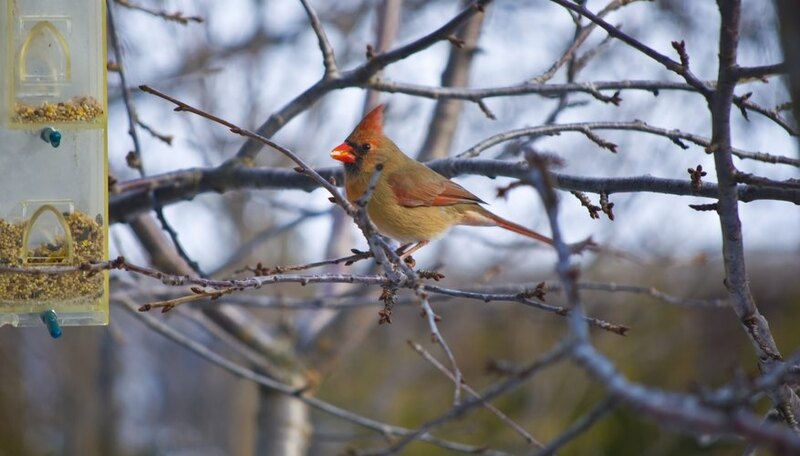 Most people think that all birds migrate during winter months, but cardinals do not. They gather in flocks and nest in thick bushes, with the number of one flock in a bush reaching as high as 70. Most people also think that cardinals are hearty and abundant creatures. However, urban development has caused numbers to drop. This is especially true in California, where cardinals are native to the Colorado River Valley. Even in North Carolina, the bird has seen population drops, according to national Geographic. Sachs, Kimelia. "Information on the Cardinal Bird." Sciencing, https://sciencing.com/information-cardinal-bird-6553926.html. 24 April 2017.